Students are expected to not only have the ability and knowledge in the field of accounting but also other skills necessary for a career, namely emotional quotient. Students who have good emotional quotient also need to apply good learning behavior. Good learning behavior will be able to improve the emotional quotient possessed by students to be able to understand the courses taught. This study aims to determine the effect of emotional quotient on the level of understanding of accounting with learning behavior as a moderator. The method used to analyze the data in this study is moderated regression analysis. The sample in this study was chosen based on purposive sampling method. The results showed that emotional quotient has a positive effect on the level of understanding of accounting and learning behaviors moderate the influence of emotional quotient at the level of understanding of accounting. TRISNA DEWI, Ni Nyoman Sri Rahayu; YOGANTARA, Komang Krishna. PENGARUH KECERDASAN EMOSIONAL PADA TINGKAT PEMAHAMAN AKUNTANSI DENGAN PERILAKU BELAJAR SEBAGAI PEMODERASI. Sekolah Tinggi Ilmu (STIE) Ekonomi Triatma Mulya, [S.l. ], v. 24, n. 1, p. 107 - 117, july 2018. ISSN 2622-1489. 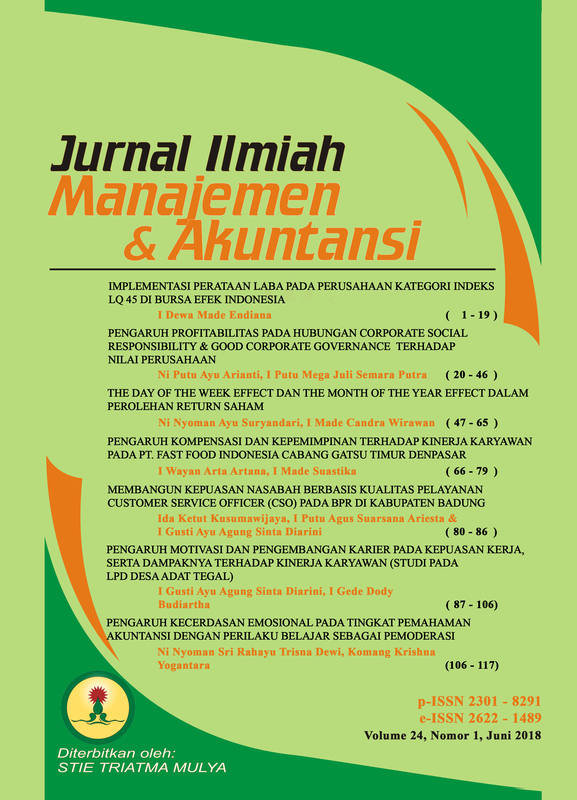 Available at: <http://triatmamulya.ejurnal.info/index.php/triatmamulya/article/view/106>. Date accessed: 21 apr. 2019.